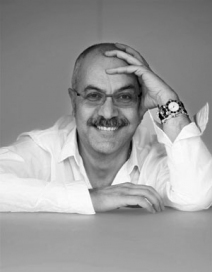 architect and designer, graduated from the ALBA and the National Academy of Fine Arts in Beirut, moved to Milan and established in 1978, together with Paolo Moroni the Sawaya&Moroni Architectural Practice and Sawaya & Moroni contemporary furniture company where he is the art director. Main activity: Architecture, Interior architecture, Interior design and product design. Sawya&Moroni commisions and activities cover private residences, yachts, hotels and commercial / office buildings in Italy and abroad. Recent projects include: The Klapson’s at the river hotel in Bangkock The Klapson’s boutique hotel in Singapore, the SCF Sovcomflot headquarters in St.Petersburg, the Mayyas shop in shop in Jedda, the Maddalena Yacht club in Sardinia, the Via Garibaldi 12 store in Genova, several companies head quarter in Saudi Arabia, the Vourakis choice store in Athens, the 60 meter MY Viki yacht, the Klapson’s boutique hotel in Singapore, many private residences in Saudi Arabia, Athens, Paris, St Jean de cap Ferrat, Cannes, London and Moscow. His design is marked by fluidity and innovation of forms defined by an elegant streamline sign combined with a twist of humor and sensuality. His design work is present in several museums, public and private collections, takes an active part to the life of design community with lectures and design events, juries and design competition panels. His work is often published on design and architectural / design books, magazine, news papers and TV programs.